Small group time is a meaningful and important part of any Preschoolers day. It’s a time when you work with a small group of students and individualize instruction based on student needs. 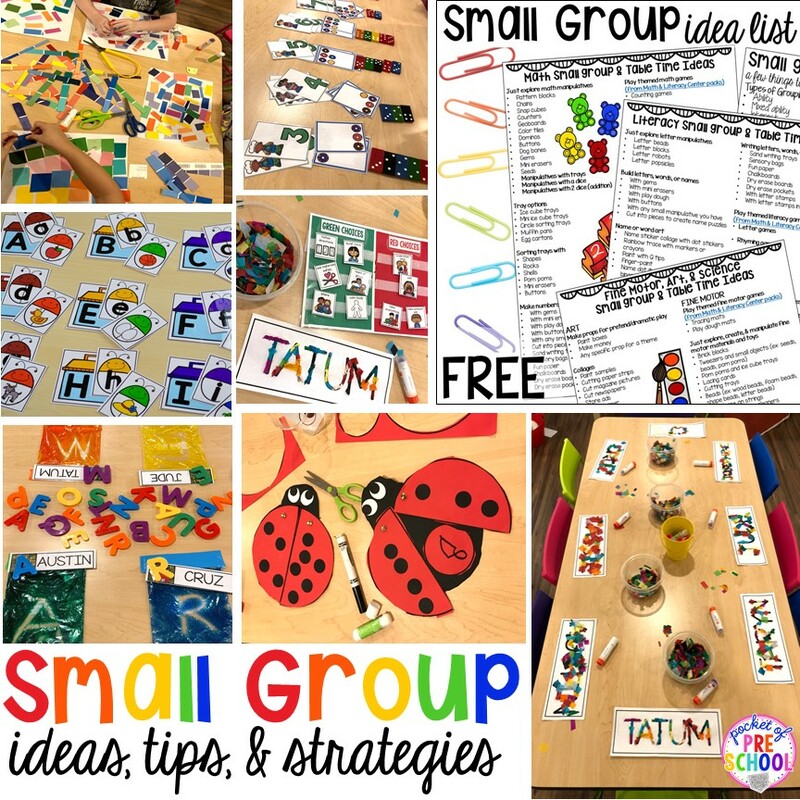 I’m always getting asked about small group time so I’m here to share all the things you need to think about, plan for, and how to make it effective in your classroom. Don’t worry about writing all of this down because I have a HANDOUT for you that you can print and plop into your teacher binder! I can simply point or cue students to make a green choice using the green and red choice board. Simply having the mini Green & Red Choice board on the table is a visual reminder itself. 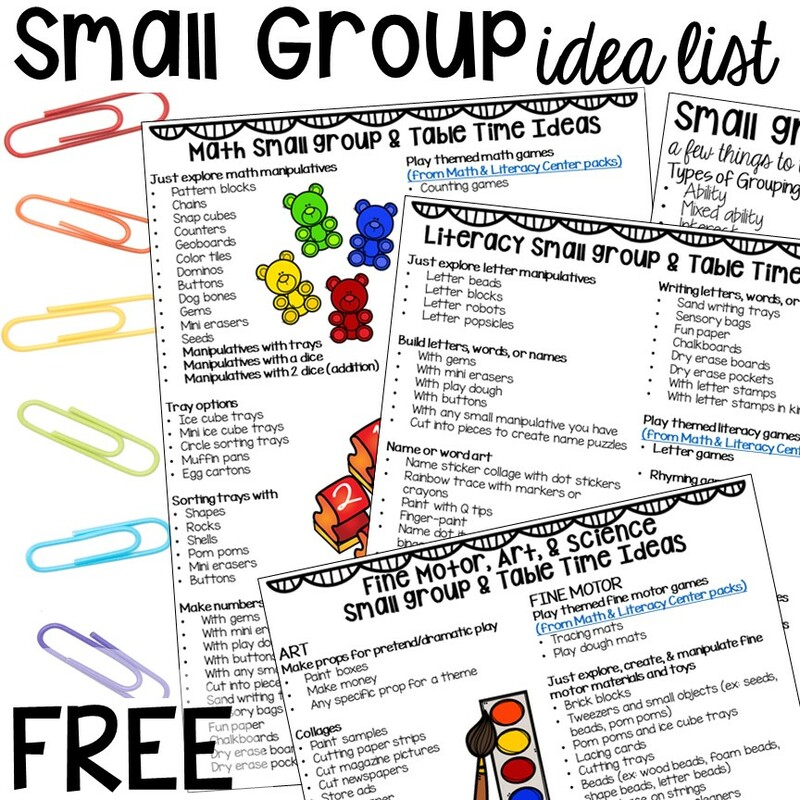 Simply put, create small groups that are appropriate for your students. The skills they are working on are not too hard and not too easy, but rather the sweet spot where they are challenged but not frustrated. 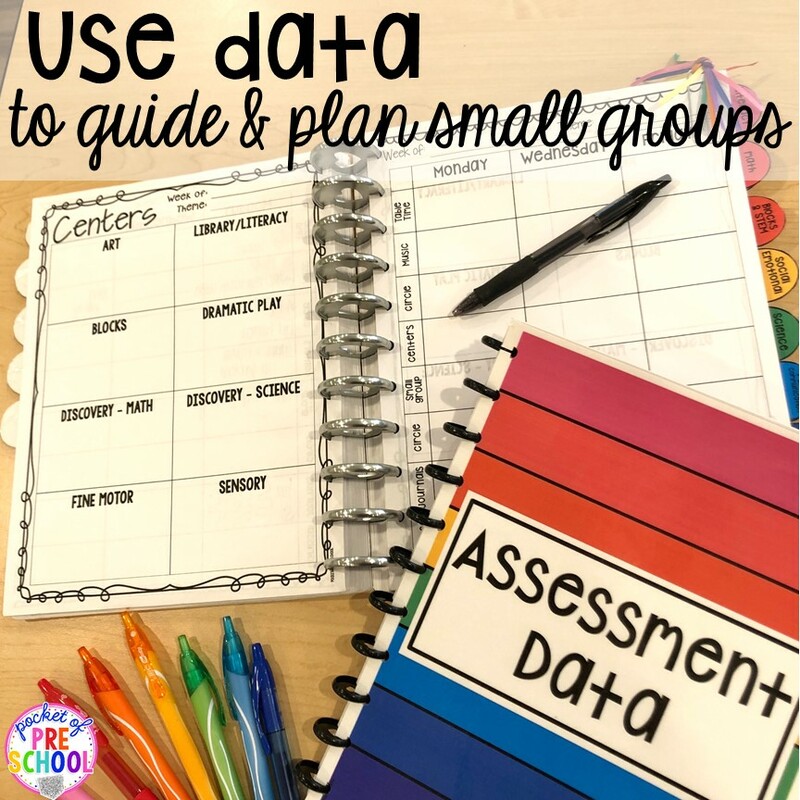 Use the assessments and data you take to plan and create your small groups. Maybe you notice that students are struggling with 1:1 correspondence during math, so then do a small group to develop that skill. Don’t create the same old small group just because you’ve done it every year. Do it because it’s what your students NEED to grow! When should you have small group time? (I do a mixture of the two based on what the small group is) Each day before students pick where they want to go for centers I tell them which direction we are heading with centers for the day. You can see my daily schedule HERE with the skills I am teaching during each part of the day too! Just remember your groups should NOT be the same all the time. Mix up the types of groupings you do and who is in them! For example, when I do an art activity or sensory activity for a small group I do random or peer selected groupings. If I am doing a math small group I will group students by ability so I can differentiate the activity for each group. 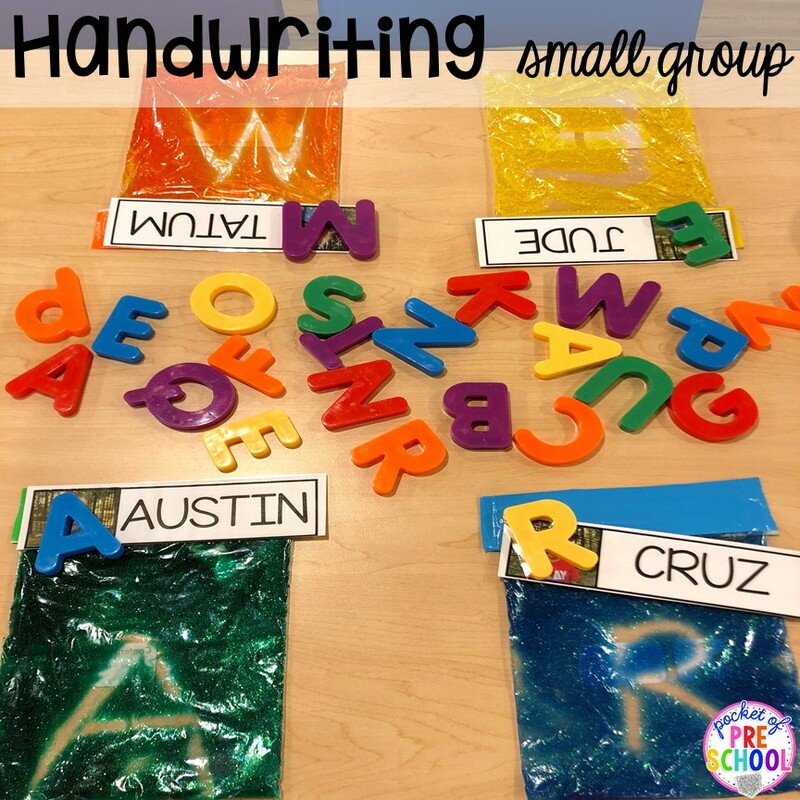 Here is a handwriting (ability) small group. Yes, you can do handwriting without worksheets! I pulled four friends at a time during centers to practice writing the letters in their name. They picked a magnet letter that was in their name, identified the letter, and wrote the letter on the baggie. Hair gel sensory bags – clear hair gel from the dollar store, glitter, and a FEW drops of liquid watercolor in a thick quart baggie with the top duck taped closed. This is a Name Art Collage small group (mixed ability) we did during small group time. Even though it’s mixed ability I still differentiated the activity by going around to each student as they made their collage asking questions. I asked them to tell me how to spell their name. For the lower level students, I said the letters and they said the letters with me or echoed the letters as they pointed to each one. For the middle level students, they told me how to spell their name as they pointed to each letter. For the higher level students, I covered up their name and they told me how to spell their name from memory. This is a Letter small group we did and I pulled students by ability during center time. My lower level friends matched the letters and I only used the letters where the uppercase looked similar to the lowercase. My middle level friends matched all the letters. My higher level friends matched the letter and sound cards and we only used about half of the puzzles. You can find this game in Insect Math and Literacy Centers. I love this cute ladybug math craft! I almost ALWAYS pull students a few at a time during centers by ability for this one. 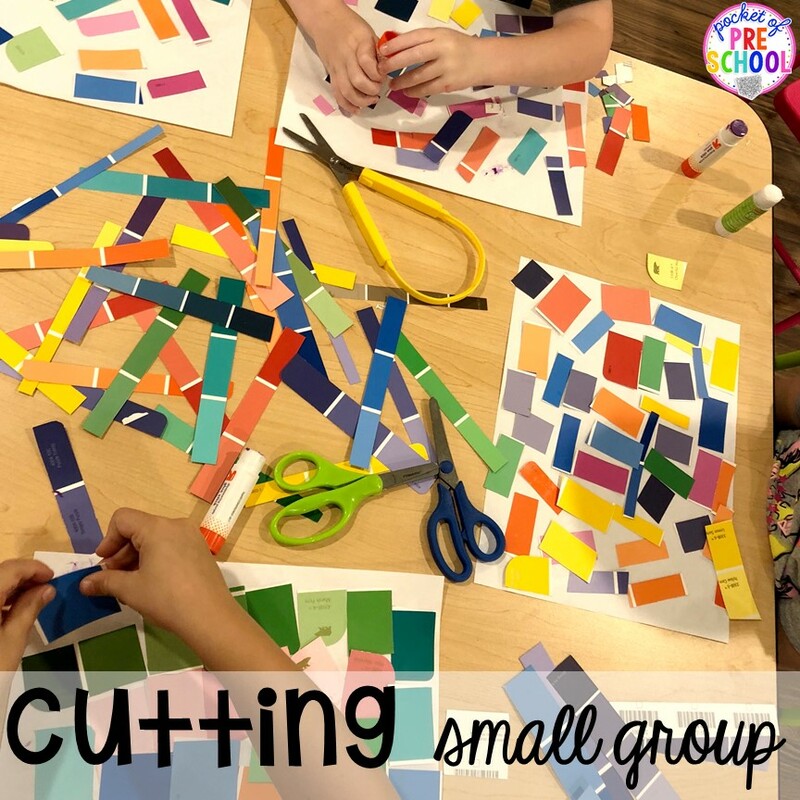 There are just so many directions and so much cutting involved ( I have students always cut as many of the pieces as they can then I do the rest). You can find this game in Insect Math and Literacy Centers too. This last example is a scissor skills small group that is picked randomly. Some students are using bounce back scissors to help them cut and others are using regular scissors. 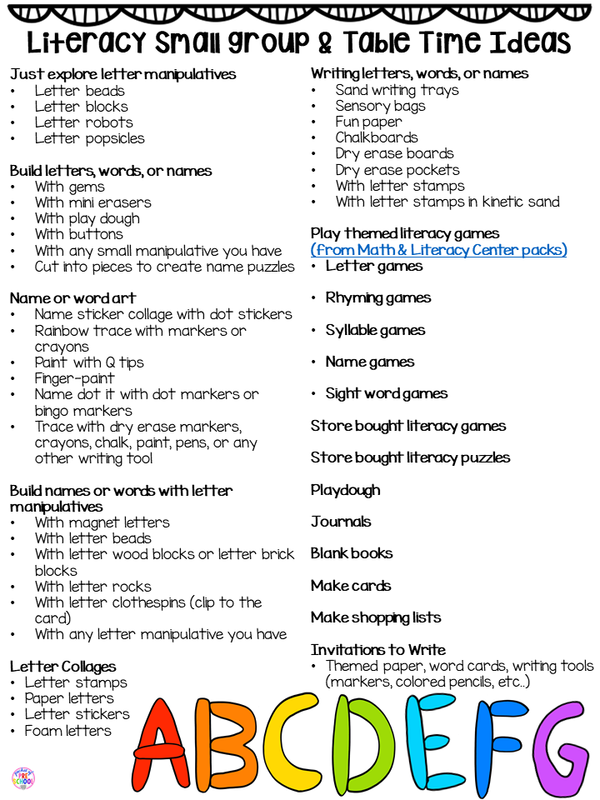 Table Time : These skills can be done independently (without assistance from a teacher or peer). Small Group: New or familiar game or activity. It’s the perfect time to teach new games and activities. 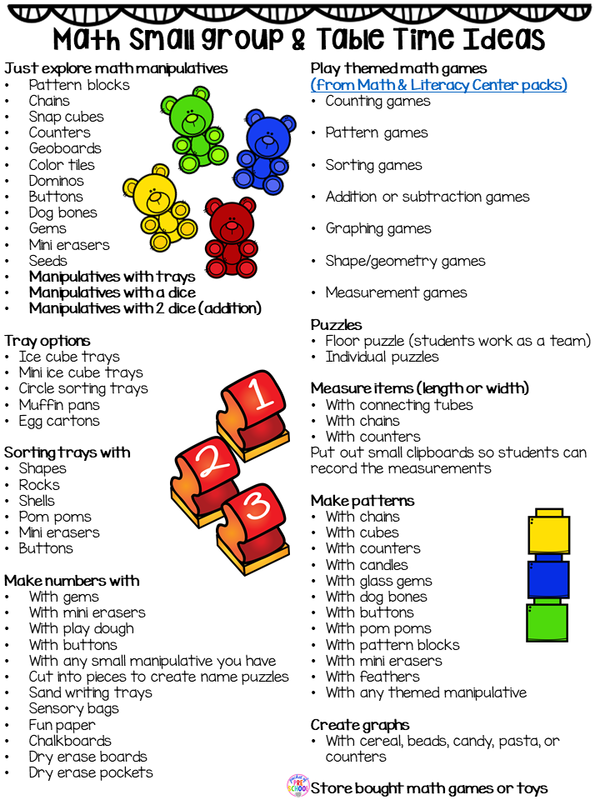 Table Time: Familiar game or open ended activity. It’s a time to practice or review skills. Now the question I always get asked….WHAT do I do during small groups? Well, everything! At some point in the month I try to touch on each learning domain or integrate each learning domain into small group time. I teach three days a week so one day is always literacy and one day is always math. The other day I rotate art, sensory, fine motor, or a skill I notice students need extra assistance. I did a whole FB live all about small groups and I talk through all of this with you. Watch below!